institutionalised humiliation of paid care workers – a process made possible by the gendered inadequacy of law. Her book provides significant insights into the working lives of homecare workers. Their experiences and opinions are captured in the character narratives through which the book is structured: Cheap Nurse, Two-a-Penny, Mother Superior and Choosy Suzy. Each is connected to a specific area of law at work: equal pay law, the legal protection of employment, minimum wage law, and workforce regulation via the Care Act 2014. FREE DOWNLOAD OR BUY BOOK. An utterly compelling account … Perhaps the best ever example in modern labour scholarship of research-led recommendations. Professor Keith Ewing, Kings College London. An innovative and meticulous combination of ethnography and legal analysis. Professor Lizzie Barmes, Queen Mary University of London. Homecare is the UK’s fastest growing source of low-waged work for women. More than a million women now provide paid care to support older and disabled people living in their own homes. Homecare jobs are mainly with private companies who depend upon state funding of social care. There are few better examples of the extent to which the British state disrespects working-class women than the fact that homecare jobs offer among the worst of wages and working conditions. 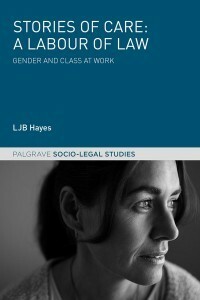 Hayes identifies how law facilitates and endorses judgments of inferiority about the working class women who work in the care industry. These judgments are variously made by politicians, governments, the judiciary, social policy makers and management. Hayes argues, this is institutionalised humiliation in action. She draws on examples in statute, case law and social policy to show how laws’ intellectual reasoning and sexist values justify the poor treatment, low pay, insecurity and virtual invisibility of homecare workers in public life. Stories of care: a labour of law illustrates that a remedy for the crisis in social care is not possible without reform of labour law. Such reform must recognise the forms of work in which working-class women engage as worthy of legal protection. It must deliver legal rights, including collective bargaining, which are capable of overturning the sexist undervaluing and undermining of care work as paid labour. Without labour law reform, social care provision will continue to flounder. Without adequate social care, a rapid reversal of the gains made for women’s equality in the past fifty years is frighteningly foreseeable.